Resembling and old barn door, this piece is handcrafted using natural pine slats, overlaid with two crossbeams to give dimension. Unique faux hinges and hardware provide the finishing touches. This door features strong sentiments that warm the heart and bless the soul. Includes sawtooth hanger for wall application. 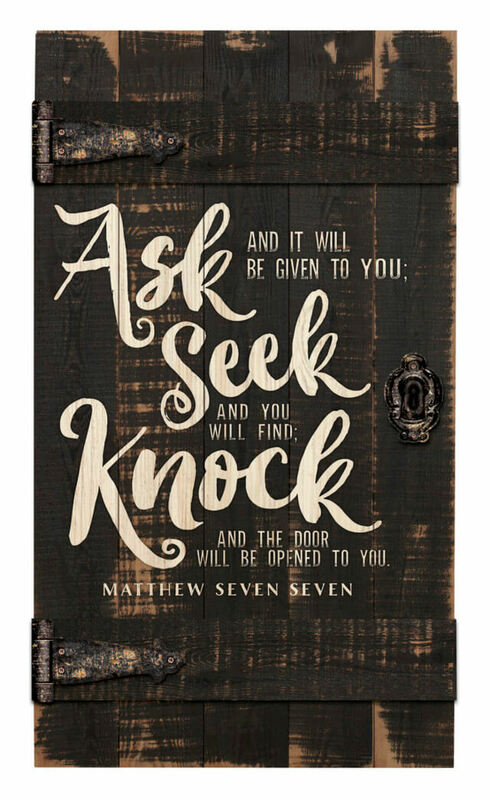 Barn door is distressed to a dark weathered stained look with encouraging scripture reading, Ask and it will be given to you, seek and you will find, knock and the door will be opened to you. Matthew seven seven.